Victor Alfred Paul Vignon, born in 1847 in Villers-Cotterets, Aisne, died and was buried in Meulan, Yvelines in 1909. He was an impressionist landscape painter and writer. Of him it was said that his work was more popular with collectors than with art critics. student of Tonalist painter, Camille Corot , and worked in Clamart, Bougival and then La Celle-Saint-Cloud where he painted Saulaie at Bougival (1877), the Way of the Plain Bougival and Road Jonchère in La Celle-Saint-Cloud . He then moved to Pontoise and Jouy-le-Comte. From 1878-1880, he was in Auvers-sur-Oise in the company of Camille Pissarro, Armond Guillaumin and Paul Cézanne. 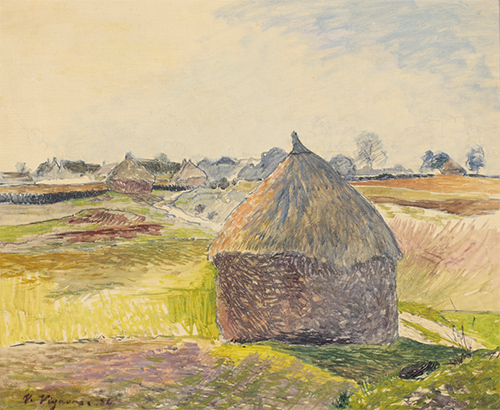 There he painted subjects similar to theirs such as Path Chaponval (1881), Côte Saint-Nicolas in Auvers (1882) and Hovels in Auvers(1883). He then moved to Nesles-la-Vallée in Eragny and the Isle-Adam with Jean-Baptiste Corot. Vignon is closely linked with Theo and Vincent Van Gogh, Dr. Paul Gachet, and pastry-writer-and painter Eugène Murer. He was also a friend of Frederick Samuel Cordey and Auguste Renoir . Vignon has never experienced the success of other Impressionists. In 1900 thanks to Dr. Viau one of his paintings was in the Universal Exhibition of 1900. In 1903, an exhibition was organized to help him. Auguste Renoir advised Durand-Ruel in making selections. “Victor Alfred Paul Vignon”, Wikipedia, fr.wikipedia.org/wiki/Victor_Vignon? Julius Stewart was a figure and genre painter from Philadelphia who spent almost his entire life in Paris. From the 1880s through the first decade of the 20th century, he ranked with John Singer Sargent as one of the most popular expatriate American painters in Paris. He was following a genre begun by his friend, Jean Beraud, but Stewart’s more vivacious work was considered especially American. Stewart was born in 1855, and his family settled in Paris when he was ten years old. His earliest painting is dated 1876. His father, William Stewart, was an outcast art collector, who specialized in works of the contemporary Spanish-Roman school, including Zamacois, Fortuny and de Madrazo. These artists had a great influence on Stewart. In the 1880s, he studied with Zamacois and de Madrazo, as well as with Jean Leon Gerome. Stewart’s first success was being chosen to exhibit at the Paris Salon in 1883. His reputation was firmly established with, The Hunt Ball (1885, Essex Club, Newark) and The Hunt Supper (1889, Buffalo Club, New York) was shown at the Paris Exposition. 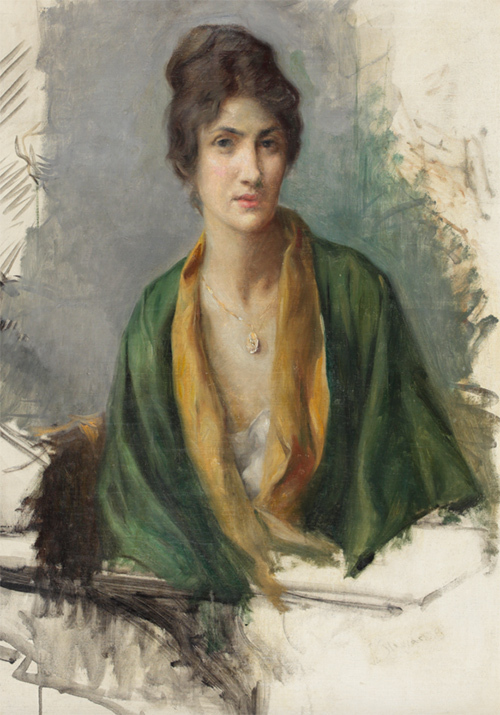 His high society women portraits show a particular fascination with their evolving roles in a changing society, from the depiction of beauty for beauty’s sake to the portrayal of the educated sophisticate. In An Enthralling Novel he succeeds in conveying the reader’s concentrated attention to the book, thus portraying her as a well-read woman and not just another pretty face. At the same time that Stewart was painting high society scenes, he painted nudes out-of-doors, a subject more acceptable in France than in America in the 1890s. By 1905, he had a religious crisis and conversion, toning down his subject matter. At the beginning of World War I, he served in the Red Cross ambulance corps and suffered a nervous breakdown. Stewart remained a bachelor, and died in 1919, having returned to the United States.